Just when you think you’ve finished your last editing draft and you’re ready to send it to an editor or professional set of eyes for review, there’s one more step to do. Yep – you need to go retro. Why? The way our eyes adjust to the screen vs. the printed page is very different and we see so much more from this vantage point. What is ‘white space,’ you ask? The blank portions of the page that balance out the printed portions. 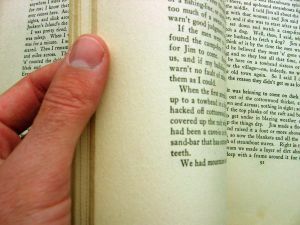 Take any modern novel, flip through it as I have suggested above, and you will notice a pattern – there is a general balance of white space and print. At a glance it tells you there’s likely too much exposition or summary happening in the larger chunks of print and you need to do more editing. After flipping casually through your manuscript a couple of times and flagging those obvious spots, re-read each page in question and decide whether the information block is vital or cursory. If it’s vital, figure out how to break up the information and spread it out without slowing down the action in other critical areas. If it’s cursory, and is explained somehow throughout the book in another way or by inference, cut it. Trust me, any professional you ask to read your work will do the flip-test with your printed manuscript. It’s one of those traditional techniques that still works for finding flaws. Now that’s not to say you can’t have the occasional block of text, but really examine what you’re saying and see if maybe you can break it into shorter paragraphs – even if you’re keeping all of the material. When the human eye sees large blocks of text, the mind tends to resist the monotony of it and the reader looses a level of quality interest in the story. The anticipation of ‘being told’ something tunes our brain into a different frequency – one to avoid at all costs.